Deliver Linear (1D) and Matrix (2D) barcodes inside any SharePoint page. Nevron Barcode for SharePoint delivers an easy and powerful way to display data driven linear and matrix barcodes directly inside SharePoint. 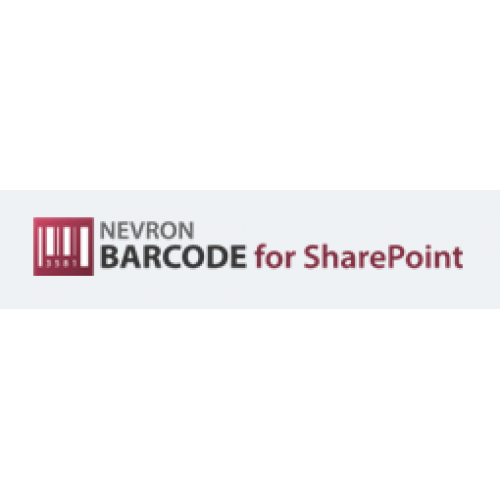 If your are looking to integrate barcode visualization inside your SharePoint pages then Nevron Barcode for SharePoint is a perfect choice. It can display virtually all widely used barcode symbologies and is fully data-driven. Support for multiple barcode areas and titles. Support for QR Code and PDF417 matrix barcodes. Low, Medium, Quartile and High correction levels. Seamless integration with WSS3.0, SharePoint 2007, 2010 and 2013. Nevron Barcode for SharePoint provides support for WSS3.0, SharePoint 2007, 2010 and 2013. The barcode web part is designed to delivers an easy and powerful way to display data driven linear and matrix barcodes in your SharePoint pages.